ARLINGTON, TX - MAY 31: Josh Hamilton #32 of the Texas Rangers hits a two-run rbi double against the Boston Red Sox in the ninth inning at Globe Life Park in Arlington on May 31, 2015 in Arlington, Texas. 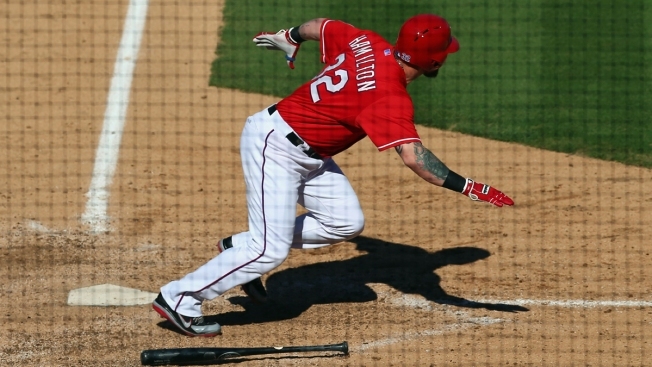 Josh Hamilton hasn't played for the Texas Rangers since Aug. 16 with a sore knee. The team actually waited a few days to see if rest would help his sore knee before finally deciding to retroactively put him on the disabled list. He's eligible to come off the DL today, but will likely come off when rosters expand on Tuesday. When he does return, it's still unknown what he'll be able to contribute immediately. Even when Hamilton does return to the roster, it'll most likely be as a pinch-hitter, at least in the short term, as the team doesn't want to risk aggravating the knee again. Jeff Banister has already made it known that the team will take it slow and go with the cautious approach with their veteran outfielder.